The fact that Saint Catherine rested her hands on the lap of the Blessed Mother did not make her a saint. She personally worked no miracles, nor did she practice externally heroic charity like other great saints. She was not materially poor as were the children of Fatima and Saint Bernadette... She sprang from upper middle class parents among the meadows and vineyards of Burgundy, France. Her father was an educated man and an excellent farmer living in the village of Fain-les-Moutiers not far from Djon. Her sanctity consists in half a century of faithful service as a simple Daughter of Charity. As the evening Angelus sounded, Catherine was born of Pierre and Madeleine Louise Labouré on May 2, 1806. She was the ninth child of a family of eleven. Fifteen minutes after her birth, her name was entered on the city records. The next day, she was baptized on the feast of the Finding of The True Cross. It seems more than a coincidence that Catherine was born at the ringing of the Angelus; surely it was God's charming touch—the heralding by our Lady's bells of the saint who was to be so highly favored by Mary. Nor was it an accident that Catherine's name received the prompt attention of the world... certainly it was her holy mother's intuition that led Madeleine Louise Laboure to call attention to her special child. Even the feast of Catherine's baptism was prophetic, for Catherine was to find the cross in every turn of her life, to have deep devotion for it, and to see a mysterious vision of the cross. When Catherine was nine years old, her mother died. After the burial service, little Catherine retired to her room, stood on a chair, took our Lady's statue from the wall, kissed it, and said: "Now, dear Lady, you are to be my mother." One day she had a dream in which she saw an old priest say Mass. After Mass, the priest turned and beckoned her with his finger, but she drew backwards, keeping her eye on him. The vision moved to a sick room where she saw the same priest, who said: "My child, it is a good deed to look after the sick; you run away now, but one day you will be glad to come to me. God has designs on you—do not forget it." Later, she awoke, not knowing the significance of the dream. Sometime later, while visiting a hospital of the Daughters of Charity, she noticed a priest's picture on the wall. She asked a sister who he might be, and was told: "Our Holy Founder Saint Vincent de Paul." Catherine had seen this same priest in the dream. In January of 1830, Catherine Laboure became a postulant in the hospice of the Daughters of Charity at Catillon-sur-Seine. Three months later, she was again in Paris, this time to enter the Seminary at the Mother House of the Daughters of Charity. Shortly after she entered her new home, God was pleased to grant her several extraordinary visions. On three consecutive days she beheld the heart of Saint Vincent above the reliquary in which his relics were exposed, each time under a different aspect. At other times, she beheld our divine Lord in front of the Blessed Sacrament; this would occur especially during Mass when he would appear as he was described in the liturgy of the day. On the eve of the Feast of Saint Vincent de Paul, July 19, the Sister Superior spoke to the novices about the virtues of their Holy Founder and gave each of them a piece of cloth from his surplice. Catherine earnestly prayed to Saint Vincent that she might see the mother of God with her own eyes. She was convinced that she would see the Blessed Virgin Mary that very night. In her conviction, Catherine fell asleep. Before long, a brilliant light and the voice of a child awakened her. "Sister Labouré, come to the Chapel; the Blessed Virgin awaits you." The little child smiled, "Do not be uneasy; it is half past eleven, everyone is sleeping... come, I am waiting for you." She rose quickly and dressed. The hall lights were burning. The locked chapel door swung open at the angel's touch. Amazed, Catherine found the Chapel ablaze with lights as if prepared for midnight Mass. Quickly she knelt at the communion rail, and suddenly, she heard the rustle of a silk dress... the Blessed Virgin, in a blaze of glory, sat in the director's chair. The angel whispered: "The Blessed Mother wishes to speak with you." Catherine rose, knelt beside the Blessed Mother and rested her hands in the Virgin's lap. Mary said: "God wishes to charge you with a mission. You will be contradicted, but do not fear; you will have the grace to do what is necessary. Tell your spiritual director all that passes within you. Times are evil in France and in the world." A pain crossed the Virgin's face. "Come to the foot of the altar. Graces will be shed on all, great and little, especially upon those who ask for them. You will have the protection of God and Saint Vincent. I always will have my eyes upon you. There will be much persecution. The cross will be treated with contempt. It will be hurled to the ground and blood will flow." Then after speaking for some time, the Lady like a fading shadow was gone. Led by the child, Catherine left the chapel, marched up the corridor, and returned to her place in the dormitory. The angel disappeared and as Catherine went to bed, she heard the clock strike two in the morning. Catherine lived the normal life of a novice of the Daughters of Charity until Advent. On Saturday, November 27, 1830, at 5:30 p.m., she retired to the Chapel with the other Sisters for evening meditation. Catherine heard the faint swish of silk... she recognized our Lady's signal. Raising her eyes to the main altar, she saw her beautiful Lady standing on a large globe. The Virgin Spoke, this time giving a direct order: "Have a Medal struck after this model. All who wear it will receive great graces; they should wear it around the neck. Graces will abound for persons who wear it with confidence." Catherine asked how she was to have the medal struck. Mary replied that she was to go to her confessor, a Father Jean Marie Aladel saying of this saintly priest: "He is my servant." Father Aladel at first did not believe Catherine; however, after two years, he finally went to the archbishop who ordered two thousand medals struck on June 20, 1832. When Catherine received her share of these first medals from the hands of the priest she said: "Now it must be propagated." The spread of a devotion to the medal urged by Saint Catherine was carried out so swiftly that it was miraculous itself. In 1876, Catherine felt a spiritual conviction that she would die before the end of the year. Mary Immaculate gave Catherine leave to speak, to break the silence of forty-six years. To her Sister Superior, Catherine revealed the fact that she was the sister to whom the Blessed Mother appeared. On the last day of December 1876, Saint Catherine passed on—once again to the hands of Mary—this time, however, in heaven. Today her beautiful remains still lie fresh and serene. When her body was exhumed in 1933, it was found as fresh as the day it was buried. Though she had lived seventy years and was in the grave for fifty-seven years, her eyes remained very blue and beautiful; and in death her arms and legs were as supple as if she were asleep. 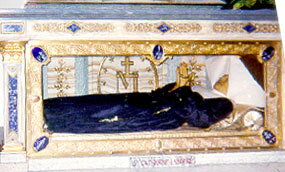 Her incorrupt body is encased in glass beneath the side altar at 140 Rue du Bac, Paris, beneath one of the spots where our Lady appeared to her.